I just happened to stumble upon Pam Jenoff’s books. I was part of a book blog tour a couple of years ago and one of the books for review was The Last Summer at Chelsea Beach. I fell in love with her story telling and writing style almost instantly! I have since bought two more books by her! This is one of the reasons I book blog….to find new authors. When I first picked up The Last Summer at Chelsea Beach, I was not really excited about reading it but I thought it sounded marginally interesting so I gave it a go and was so happy when I was hooked almost immediately! 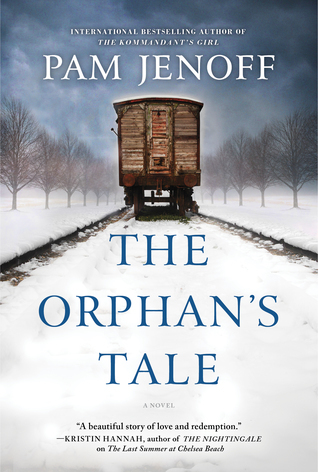 So when her new book, The Orphan’s Tale came up for review, I jumped at the chance to read it early! Fan girl moment! Noa finds refuge with a German circus, but she must learn the flying trapeze act so she can blend in undetected, spurning the resentment of the lead aerialist, Astrid. At first rivals, Noa and Astrid soon forge a powerful bond. But as the facade that protects them proves increasingly tenuous, Noa and Astrid must decide whether their friendship is enough to save one another—or if the secrets that burn between them will destroy everything. In my opinion, Jenoff is at her best when she writes war romances, but this book was far from disappointing. This book is more about friendships and fate than romance really which was fine. I personally love how Jenoff writes war romances but this was a well written and beautiful story about friendships…..but be sure to have Kleenex close by! This book was an emotional roller coaster! This book is far from lighthearted, and it tugs at the heart strings in so many ways and touches on a lot of ‘heavy’ themes. However, that said, it’s so well written and the ending so perfect that you almost don’t mind the heart wrenching, emotional parts. The characters are interesting as individual entities and the audience will surely relate to them, but it’s how they work within the story that really makes this book shine. I love the circus setting, it adds flair to the story. I love books with a circus setting, for some reason it creates a feeling of mystery and wonder which I felt worked nicely within this story. If you are looking for a good cry then this book is for you! But it’s so much more than a tear jerker, it’s a well written story about the bonds of friendship and the choices we make in life and how they affect us, all set during WWII. It’s got a lot of things that worked and made it enjoyable. Personally I would have preferred a romance because that’s basically what I associate Jenoff with, but this book was a nice and surprising read! Thanks for the Kleenex warning – I’ll be sure to have a box close to hand.